Looking for Trabuco Canyon bee removal? The Bee Man offers both commercial and residential bee removal services on a 24/7 basis. Bees are an important part of our ecosystem. Hence, our first thought when we encounter a bee removal is focused on performing a live bee removal. Honeybees are vital to the environment. Therefore, our first concern before removing any bee infestation is if we can remove the bees alive and relocate them to a local beekeeper. Consequently, we are in constant contact with beekeepers to see if they have any availability to receive more bees. However, there is a significant and robust feral honeybee population in Orange County. Even more often than not, there is simply no room to house them at the local beekeepers. 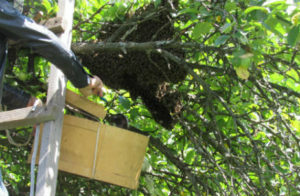 Relocating bees can also be very traumatic to the colony and can destroy the colony in transit to a new location. Above all, our priority is to human safety. Unfortunately, Orange County has two predominant types of feral honeybees, one of which is the Africanized variety. Known as “killer bees,” Africanized honeybees will defend their hive with such vengeance that people can get seriously hurt and small animals killed by these swarms. As a result, sometimes a live bee removal is not in the best interest of the residents and not an option. Regardless of your bee infestation, The Bee Man offers professional bee removal services. Although live bee removal isn’t always possible, we do advise not disturbing the bees. Please refer to our safety tips here. Finally, for your safety, if you need any Trabuco Canyon bee removal, please contact The Bee Man at (949) 455-0123.